Finally, photographic proof of what’s behind the public bathroom door. Must Wash Hands, a collection of 120 artistic photographs, offers readers a peek into the private space of the public bathroomthat unspoken and indecent yet communal and necessary space that we enter and exit every day without a second glance. With camera in hand, Carter Hasegawa travels the public bathrooms of Boston, New York, Seattle, Las Vegas, Honolulu, Indianapolis, and other American cities, snapping photos down urinals and documenting graffitied walls and wet, toilet paper-plastered floors. 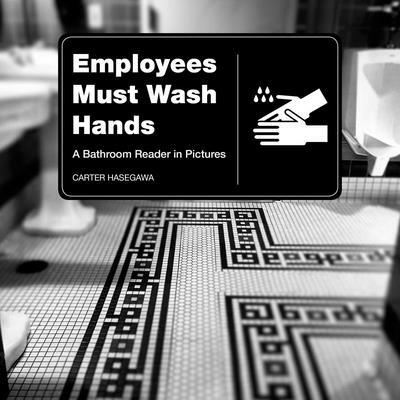 Photos are arranged chronologically” as a virtual public restroom walkthrough for the reader, and they highlight unsavory and savory bathroom elements you otherwise may not have noticedice cubes down a urinal, unconventional Employees Must Wash Hands” signs, interesting tile details, or a jar of baby food on the floor. These wry but intimate photos are interspersed with popular bathroom trivia, illegally overheard bathroom conversations, half-serious comments on proper” bathroom etiquette, and seriously real anecdotes. For fans of offbeat photography and humor books such as Awkward Family Photos, People of Walmart, and Regretsy, Must Wash Hands transforms the crude and disgusting into something more compelling and beautiful, prompting the viewer to pause, admire, laugh, and connect. Carter Hasegawa is a part-time bookseller at Porter Square Books in Cambridge and a full-time children’s book editor at Candlewick Press. He holds a Master of Arts degree in children’s literature from Simmons College. Must Wash Hands is his publishing debut. Originally from Seattle, he now lives (and uses the bathroom frequently) in Boston.